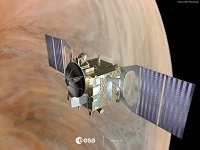 ESA Science & Technology: Could Venus be shifting gear? ESA's Venus Express spacecraft has discovered that our cloud-covered neighbour spins a little slower than previously measured. Peering through the dense atmosphere in the infrared, the orbiter found surface features were not quite where they should be. Using the VIRTIS instrument at infrared wavelengths to penetrate the thick cloud cover, scientists studied surface features and discovered that some were displaced by up to 20 km from where they should be given the accepted rotation rate as measured by NASA's Magellan orbiter in the early 1990s. These detailed measurements from orbit are helping scientists determine whether Venus has a solid or liquid core, which will help our understanding of the planet's creation and how it evolved. 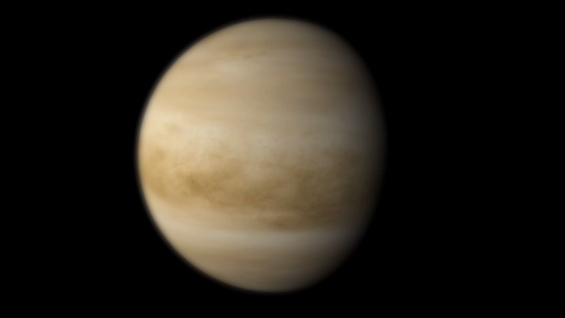 If Venus has a solid core, its mass must be more concentrated towards the centre. In this case, the planet's rotation would react less to external forces. The most important of those forces is due to the dense atmosphere - more than 90 times the pressure of Earth's and high-speed weather systems, which are believed to change the planet's rotation rate through friction with the surface. In the 1980s and 1990s, the Venera and Magellan orbiters made radar maps of the surface of Venus, long shrouded in mystery as well as a dense, crushing and poisonous atmosphere. These maps gave us our first detailed global view of this unique and hostile world. Over its four-year mission, Magellan was able to watch features rotate under the spacecraft, allowing scientists to determine the length of the day on Venus as being equal to 243.0185 Earth days. However, surface features seen by Venus Express some 16 years later could only be lined up with those observed by Magellan if the length of the Venus day is on average 6.5 minutes longer than Magellan measured. This also agrees with the most recent long-duration radar measurements from Earth. "When the two maps did not align, I first thought there was a mistake in my calculations as Magellan measured the value very accurately, but we have checked every possible error we could think of," said Nils Müller, a planetary scientist at the DLR German Aerospace Centre, lead author of a research paper investigating the rotation. Scientists, including Özgur Karatekin of the Royal Observatory of Belgium, looked at the possibility of short-term random variations in the length of a Venus day, but concluded these should average themselves out over longer timescales. On the other hand, other recent atmospheric models have shown that the planet could have weather cycles stretching over decades, which could lead to equally long-term changes in the rotation period. Other effects could also be at work, including exchanges of angular momentum between Venus and the Earth when the two planets are relatively close to each other. "An accurate value for Venus' rotation rate will help in planning future missions, because precise information will be needed to select potential landing sites," noted Håkan Svedhem, ESA's Venus Express project scientist. While further study is needed, it's clear that Venus Express is penetrating far deeper into the mysteries of this enigmatic planet then anyone dreamed.